» Celebrate Spinach Lover’s Month with Popeye! 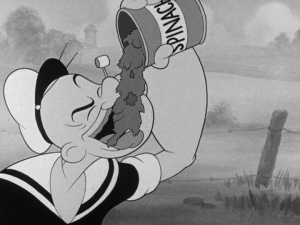 Popeye > News > Uncategorized > Celebrate Spinach Lover’s Month with Popeye! -Soon after Popeye first appeared in January 1929, spinach became the third favorite children’s food behind turkey and ice cream. They wanted to be just like Popeye and grow up big and strong! -Crystal City, Texas has an annual spinach festival and proclaims itself as the “spinach capital of the world.” To make sure everybody knows it, there is even a statue of Popeye in front of its city hall. Popeye lovers, make a note: Crystal City for the next vacation! -Spinach is now a common ingredient in salads, and has become even more popular because of its lutein content that can help prevent macular degeneration. Popeye is strong, but he also is smart. He knows spinach has all sorts of helpful ingredients to help the body! We hope you enjoy these awesome facts about spinach and take part in Spinach Lover’s Month yourselves. Eat some spinach!